 For the frazzled Anglophile, the countryside-enamored reader, here's a bit of romance, light mystery, and the reassuring stability of a timeless English village--in short, another Stewart comforter (The Stormy Petrel, 1991, etc.). Here, a young widow returns in 1947 to her childhood home and the enigma of her parentage. Kate Herrick, nÇe Welland, who lost her husband in the war, is summoned to Scotland by her beloved grandmother, formerly a cook in the household of Sir James Brandon. She asks Kate to return to their native village in the north of England, where Kate was raised by Gran and severe Aunt Betsy. Kate's mother Lilias, who'd become pregnant while serving at the Brandons' estate, had left Kate at six, never to return. Gran had told Kate that she had ``gone with the gipsies,'' but some years later Kate learned that her mother and new husband had been killed in Ireland in a bus accident. Now, Kate is to come again to Gran's Rose Cottage, long shuttered, charged with shipping some of Gran's belongings to her in Scotland and with locating a neatly hidden safe containing family items of sentimental value. But someone has broken into the cottage, ripped out the safe, and removed its contents. Then there are strange rumors of odd appearances, generated mainly by the ``Witches Corner''--comprised of two gossipy ladies, as well as a feathery individual who's sure she has ``the sight'' and has seen a dead woman digging in the cottage yard and piling flowers on the grave of mean Aunt Betsy. With the help of young Davey, son of old family friends, and scraps of information from neighbors, Kate will at last discover an absent mother and a name for an unknown father. 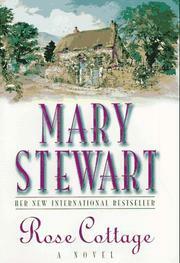 Soothing as a warm brew on a cold night are Stewart's satisfying denouements--and environs: ``. . . willows and wild roses, cuckoo-pint and king cups, and a wood pigeon crooning in the elm.'' Mild doings in enchanting surroundings.